This name is interpreted as 'big Pierce' in the Ordnance Survey Name Book. However, An Seabhac reports that in his time, nearly a century later, nobody in the locality had an explanation for the name but they did not think it was related to the personal name Piaras. There is a lower peak to the N called Piaras Beag. On the saddle between Piaras Mór and Masatiompan is an ogham stone bearing an inscription which translates as: Ronan, the priest son of Camogann. There is a chi-ro monogram (representing 'Christ') above it and a Greek cross in a circle on the other side (Barrington, Discovering Kerry, 180). Piaras Mór is the 81st highest place in Ireland. Pierasmore is an unusual outcrop at the northern end of the main Brandon ridge. The summit is most easily reached from the Dingle Way which passes north of it at its col with Masatiompan. Suitable starting points using this route would be either Q43424 12610 A (from the west and where there is a large carpark) or Q50825 14586 B (from the east) In either case, following the Dingle Way will take one easily to the col, from which the summit is 500m south. 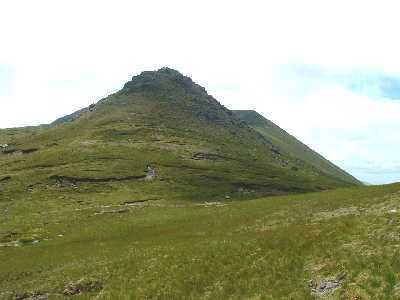 The summit is normally combined with a traverse of the Brandon ridge, typically taking in from Masatiompan to Brandon itself, but easily extended south to Brandon Peak and Gearhane; or if a long day is planned, right to the Conor Pass. Using the Dingle Way, the ascent should take under two hours. Views on a good day are spectacular in all directions, although Masatiompan does dominate to the north. There is a ogham stone on the col between Pierasmore and Masatiompan, whose inscription translates as ‘Ronan, the priest son of Comgall’.